kathleen dames: This is not a monthly blog. Goodness gracious, where have I been? I haven't posted since ... December 19th?! Apparently, I've been busy. Last-minute Christmas knitting (bears for the girls and one of their cousins, hats + mittens + felted balls for the other cousins, scarf for Mom, as-yet-unfinished hat for Dad, and trying to design a cap for my sister), baking and candy making, and three weeks of kid wrangling, including over the East River and through the air to the grandmothers' houses. Life would be easier if Penelope's preschool calendar was in sync with Isobel's and Stephen's. 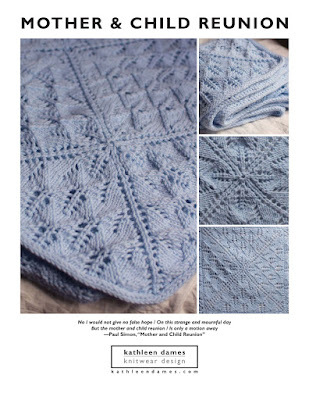 Amidst all that I agreed to a design for Knitscene (yay!) and have been talking with the editor of the now semi-annual Jane Austen Knits (double yay that a one-time idea has turned into a regular publication) to do some projects for that. So, on my plate I've got one done, except for some last-minute calculations, one half-way through the process both in knitting and pattern, and one that's just a sketch and a swatch. Being a designer keeps one pretty busy! Inspiration comes in different forms. Sometimes I'm inspired by a call for submissions, sometimes it's an empty spot in my closet/sweater drawer, and often it's a "crazy" idea that I have to see through to the end. There are, of course, a wide variety of crazy ideas from a stitch pattern to a detail in a museum piece to my ever-increasing understanding of what you can do with knitted fabric. The more you knit, the more you'll know. I like interesting details, prefer working mostly in one piece (and in the round, if possible), and am always inspired by the brilliance of Elizabeth Zimmermann. Next come the doodles! Nick would tell you that I've been in training for this since college, when my notebook margins were littered with dress sketches. Now, it's a succession of Moleskine note and datebooks that bristle with notes, descriptions, lists, and, of course, drawings. And then, most often, comes the yarn (sometimes it comes first - we all know how it can go at the LYS: the yarn just demands to come home with you, saying "You'll figure out later what I'm meant to be"). I'm a loose knitter (the only relaxed thing in my world! Kidding! Sort of :) , so I often have to go down a needle size or two from the ballband suggestion, if I'm knitting a sweater. For lace, of course, you go up a needle size, and down for socks, mittens, even hats on occasion. The great thing about being the designer is that you are swatching for the fabric you want, not a particular number of stitches per inch. It's freeing, though it puts a lot of pressure on said swatch when writing the pattern. More to come ... tomorrow? I'm not sure this will again become a daily blog, but I'm going to aim for at least a few times a week. Happy New Year! Looking forward to reading more about your process of designing ! I enjoyed making your 'Turn of the Glass..